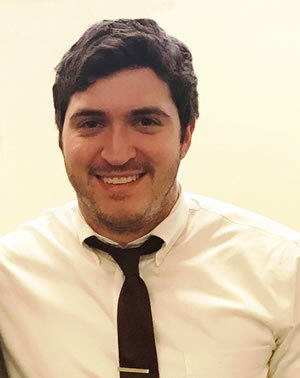 Nov. 28, 2017 — Tyler Hubert, a third-year student at the University of Houston Law Center, placed third in the inaugural Ultimate Writer Regional Writing Competition sponsored by the Texas Young Lawyers Association and Baylor Law School. In addition to a trophy for his top-three finish in the state's only legal writing competition, Hubert will receive $500 at an awards reception Dec. 15 at the State Bar of Texas offices in Austin. "I am just happy to have represented UHLC well," Hubert said. "This writing competition was a great opportunity to showcase my legal writing skills, and I am very grateful to the LSS (Lawyering Skills and Strategies) professors for their constant encouragement and support. "The competition provided cases and statutes with a fact pattern, and we had to write a trial brief representing the plaintiff in a timber trespass case," Hubert explained. "We had to argue that the defendant had committed timber trespass and then we had to determine the level of damages that the law required." The first and second place winners were Michael Davis and Alex Chern, both of the University of Texas School of Law. They will receive $3,000 and $1,500 respectively. As the winning law school, UT will keep the master trophy until next year's competition. Each of seven participating law schools submitted three entries for the regional competition. Members of the Young Lawyers Association narrowed the 21 entries to the 10 best, with two Baylor legal writing professors selecting the three top finishers and five honorable mentions. Criteria, according to contest information, was "based on originality, logic, reasoning, analysis of the issues, use of authorities, clarity, organization, correctness of format and citations, grammar, style, and strength of conclusions." "I am very proud of Tyler's success in the competition, but not at all surprised," said Katherine Brem, clinical assistant professor of Lawyering Skills and Strategies. "His work as my research assistant the past year has been first-rate. "Tyler is a dedicated, hard-working student with sharp analytical skills, and his writing rivals that of young lawyers I have worked with in practice," she continued. "He exemplifies the skills we hope each of our students masters through the Lawyering Skills and Strategies classes we offer at the Law Center."